Another international break is finally coming to an end meaning that the Premier League returns this weekend with week 12 matches taking place Saturday through Monday. Fortunately for all of us, this is the final headache of international matches until the end of March. It also means that the holiday period of matches is nearly upon us meaning some excellent club soccer matches to enjoy. This weekend brings some great match-ups to watch starting out with Manchester City vs Swansea City. With only two places and three points separating the two, this should be a good one to watch, especially considering City’s recent struggles and the recent good form for the Swans. Everton take on the revitalized West Ham United who are currently in fourth place, but still just four points above the Toffees who are in tenth. Everton have started to pick up points more recently, but still playing out too many draws against teams that they should be beating if they hope to stake a European place again. Saturday’s big match will be the late kickoff between Arsenal and Manchester United. United’s injury woes continue while Arsenal still have doubts with several of their players. This one could be quite entertaining considering the attacking flair of both teams coupled with question marks at defense. Sunday’s matches could be interesting, but at the same time could end up being absolute stinkers. Monday sees Southampton looking to continue their excellent start to the season and remain second in the table. Aston Villa may not be in the relegation places at the moment, but they are bottom of the form table with one draw and five losses in their last six. 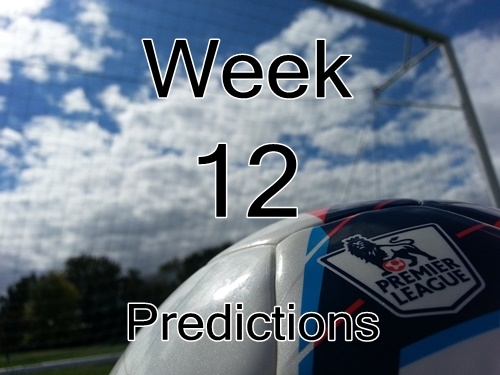 Please feel free to leave your own predictions in the comments below. Are there any predictions that you disagree with? What are your picks for this weekend?